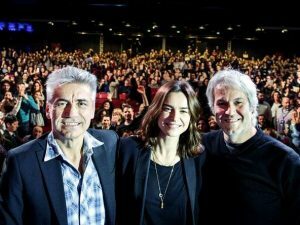 Over 2000 people for Ligabue in the Concordia Hall, turned for the occasion into the biggest movie theatre in Italy. 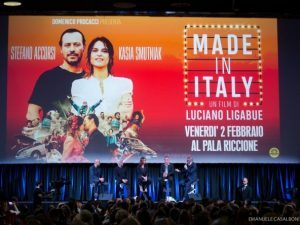 On Friday, February 2nd, 2018, Luciano Ligabue presented his third movie, “Made in Italy”, at Palariccione. Over 2,000 fans from all over Romagna, forced the organizers to arrange a second presentation and a second screening of the film, despite having turned for the occasion the Concordia Hall into the biggest movie theatre in Italy (1,300 seats). 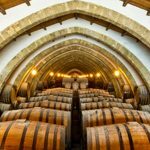 This testifies to the great flexibility of Palariccione, able to host large events, conventions, meetings, fashion shows and product launches. Cinema is not foreign to Palariccione, which annually hosts Ciné, film festival extremely appreciated by public and professionals alike for the excellent selection of movies presented. In addition to Ligabue, the event organised by Giometti Eventi also saw the participation of Kasia Smutniak, Made in Italy’s lead actress alongside Stefano Accorsi, and producer Domenico Procacci.